One of the primary reasons why General Manager Jerry Reese and Vice President of Player Evaluation Marc Ross were fired was their inability to satisfactorily address an offensive line that had begun to deteriorate during the Super Bowl season of 2011. For years, Reese and Ross invested premium draft picks and free agent resources at the position, but to no avail. Enter new General Manager Dave Gettleman, who initially won over the hearts and minds of many Giants fans tired of inept offensive line play by focusing much of public comments on the “hog mollies” up front. So what did Gettleman do? He almost completely gutted the previous group. Justin Pugh (2013 1st rounder), Weston Richburg (2014 2nd rounder), and D.J. Fluker were allowed to walk in free agency. John Jerry was cut before the season started. Somewhat oddly, the only unrestricted free agent the team chose to re-sign was John Greco. Newcomers included Nate Solder (4 years, $62 million), Patrick Omameh (3 years, $15 million), and 2018 2nd-round draft pick Will Hernandez. 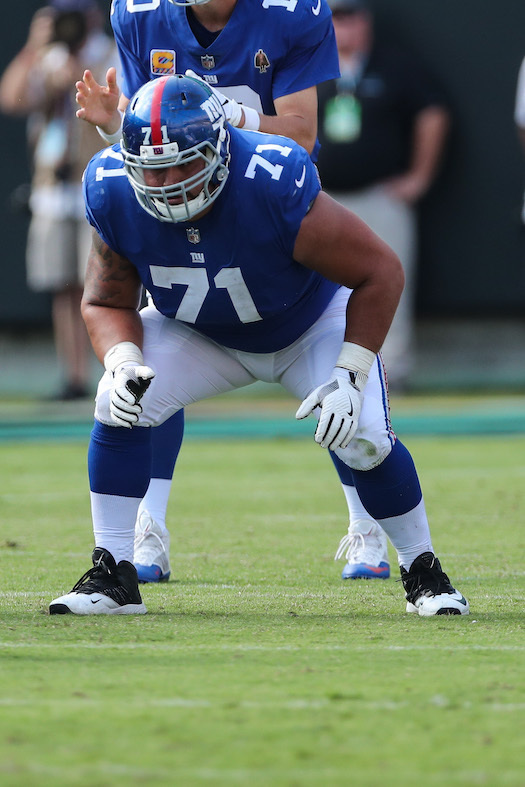 Notably, Ereck Flowers (9th player taken in the 2015 NFL Draft), who the previous administration had refused to shift to right tackle, was finally moved to the spot that many argued would be his best position. The only real surprise coming out of the OTAs and training camp was that Jon Halapio beat out Brett Jones at center, with the latter eventually being traded to the Minnesota Vikings in late August. The new offensive line coach was Hal Hunter, a man with an uninspiring resume and who was also out of football in 2017. The Giants started the season with Nate Solder at left tackle, Will Hernandez at left guard, Jon Halapio at center, Patrick Omameh at right guard, and Ereck Flowers at right tackle. This group did not play well and the offense struggled mightily to score points. Indeed, there appeared to be no measurable improvement over the previous pathetic groups. The Giants began the season 1-7, scoring an average of 15 points in six of those losses despite the presence of Odell Beckham and Saquon Barkley. Injury and an ineffectiveness soon led to shakeups up front. Halapio broke his ankle and leg in the second game of the season and was first replaced by John Greco and then Spencer Pulley, who was claimed off of waivers from the Los Angeles Chargers. The new regime also decided it had seen enough of Flowers and Omameh. Flowers was benched after the second game and replaced by second-year undrafted free agent Chad Wheeler. Omameh lasted a bit longer, starting the first six games before being cut in November. Greco first took his spot, then newcomer Jamon Brown, who was claimed off of waivers from the Los Angeles Rams. The 2.0 version of the 2018 offensive line thus included Solder-Hernandez-Pulley-Brown-Wheeler. The best thing that could be said of this group was that it wasn’t as crappy as the previous group. Team scoring improved, but Pulley and Wheeler were clearly weak links. Brown looked the part, but demonstrated the same inconsistency that led to him being cut by the Rams. And it rapidly became apparent that the desperate Giants dramatically overpaid Solder, who did settle down more as the season progressed. (Unfortunately, it was the Giants’ failed attempt to land guard Andrew Norwell in free agency that led to the Giants acquiring both Solder and Omameh). While Hernandez experienced the expected rookie growing pains, he improved and was named to the All-Rookie team. Overall, for yet another season, the line remained the offense’s Achilles’ heel, with the free agent newcomers not playing as well as expected, and the team being forced to start two mid-season waiver-wire pickups. The Giants claimed Jamon Brown off of waivers from the Los Angeles Rams at the end of October 2018. He was quickly inserted into the starting lineup, and played in the final eight games as the starting right guard. The 6’4”, 340-pound Brown was originally drafted in the 3rd round of the 2015 NFL Draft by the Rams. Brown has played in 50 regular-season games with 38 starts. He was suspended the first two games of the 2018 season for violating the NFL Policy and Program for Substances of Abuse. Brown’s size and strength is an asset in the running game, but he was too inconsistent in pass protection. He also needs to cut down on his penalties.